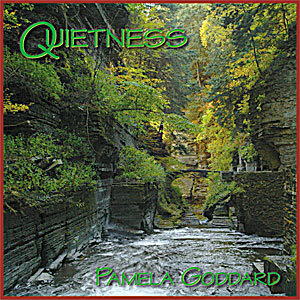 Would you like one or more copies of Quietness? The price is $15 per copy and includes mailing costs. Write up a short note with your mailing address. Put it all in an envelope, stamp the envelope, and send it to me. Your music will be in the mail the next business day after your check arrives. You can always contact me by telephone or Email with your questions! Want it sent as a gift? With wrapping? Contact me! Notecards and postcards featuring the artwork from the CD are also available. Notecards (with envelopes) are $1.50 or four for $5. Include your card order with the CD order! For a great gift combo: Many of these stores also carry notecards with the Treman Gorge art from the CD cover!